The question raised by the find is this: Was Egypt’s monotheistic-trinitarian Aten /Atem — the original source and influence of the monotheistic religion of the semitic peoples? Picture: Courtesy of Hebrew University of Jerusalem. Archaeologists in Jerusalem have unearthed the most ancient written document ever found in the Holy City – a tiny fragment of a letter thought to be addressed to Akhenaten, the “heretic” pharaoh who ruled Egypt during the 14th century B.C. Discovered outside Jerusalem’s Old City walls, the document consists of a minuscule clay fragment — about one square inch — covered with cuneiform script in ancient Akkadian. Thought to date back some 3,400 years, the fragment appears to have been part of a tablet from the royal archives. Indeed, the script on the chip, which includes the words “you,” “you were,” “later,” “to do” and “them,” is of a very high level, according to Wayne Horowitz, a scholar of Assyriology at the Hebrew University Institute of Archaeology. “It was written by a highly skilled scribe that in all likelihood prepared tablets for the royal household of the time,” said Horowitz, who deciphered the script with colleague Takayoshi Oshima of the University of Leipzig, Germany. The fragment is believed to be a contemporary of the 380 tablets discovered in the 19th century at Amarna in Egypt in Akhenaten’s archives. The son of Amenhotep III and also the father of Tutankhamun, Akhenaten (1353-1336 B.C.) is known as the “heretic” pharaoh who introduced a monotheistic religion by overthrowing the pantheon of the gods to worship the sun god Aton (see Aten). The Amarna archives include tablets sent to Akhenaten by the kings who were subservient to him in Canaan and Syria, and provide details about the complex relationships between them. Among these tablets are six that are addressed from Abdi-Heba, the Canaanite ruler of Jerusalem. “The tablet fragment in Jerusalem is most likely part of a message that would have been sent from the king of Jerusalem, possibly Abdi-Heba, back to Egypt,” said Eilat Mazar, the Hebrew University archaeologist who carried the excavation. “The find testifies the importance of Jerusalem as a major city in the Late Bronze Age, long before its conquest by King David,” Mazar said. The oldest known text previously found in Jerusalem was a tablet unearthed in the Shiloah water tunnel in the same area. Celebrating the completion of the tunnel, it dated back to the eight century B.C. This tiny clay fragment predates that tablet by about 600 years. The most dramatic upheaval recorded in the three thousand year history of ancient Egyptian religion is the reign of Akhenaten. In his fifth year of reign, king Amenhotep IV changed his birth name ‘Amun-is-content’ to Akhenaten ‘one who is akh for the Aten’, akh evoking Egyptian words covering notions of usefulness and light. He founded a new city Akhetaten ‘Horizon of the Aten’ at a desert bay at a point halfway between Memphis and Thebes, now know as Amarna. Here the only god worshipped by the king would be the sun-god. The temples at Amarna present vast open spaces with altars for offerings and raised platforms. There are pictorial sources for the life of the temples, and inscriptions in the tombs of officials, recording hymns to the sun-god. The singing of hymns to the sun-god as creator seems to have been at all periods the central feature of the cult of the sun-god Ra. However, this hymn is radically different in its systematic exclusion of any other deities. The singing may have taken place at specific moments of day and year, and in demarcated places within the sun temples, above all the open-air platforms with stepped approach and walls screening the worshipper from view (for such balustraded platforms see Shaw 1994, with reference to monuments including UC 401). The difference between traditional and Amarnan religious expression is clearest in the iconography of Akhenaten, both in the unusual proportions for the male and female human body, and in the ‘portrayal’ of the sun-god. At Amarna the sun-god is depicted in radical new style as sun-disk (in Egyptian itn, generally rendered in English as Aten) with sun-rays terminating in hands offering life to the king and the women nearest to him. The Great Hymn to the Aten is our principal source for the radical reformulation of ancient Egyptian belief in the reign of Akhenaten. It is inscribed in thirteen columns of hieroglyphs on the west wall of the courtier Ay at Amarna. The original hieroglyphic inscriptions have suffered from vandalism since discovery. The best copy is that by Davies 1908b: pl.27 and pl.41, and an accessible handcopy of the hieroglyphs is in Sandman 1938: 93-96.
living disk, origin of life. you have filled every land with your beauty. You are fine, great, radiant, lofty over and above every land. you are the sun, you have reached their limits. You bind them (for) your beloved son. You are in their sight, but your movements are hidden. no eye can see its other. Anything of theirs can be taken from under their heads, they would not know. Darkness envelops, the land is in silence, their creator is resting in his horizon. awakened and standing on their feet. their arms are in adoration at your sunrise. their wings in adoration for your spirit. they live when you have shone for them. Your rays penetrate the Great Green. and walks on his legs, going out from it. How numerous are your works, though hidden from sight. Unique god, there is none beside him. You mould the earth to your wish, you and you alone. All on high that fly with their wings. for you make foreign lands different. the lord of every land. Shine for them, O disk of day, great of dignity. to water their fields with their settlements. How effective they are, your plans, O lord of eternity! you shine and they live and grow for you. heat so they may taste you. to see what you make, while you are far, and shining in your form as living disk. you create … alone, what you have made. You instruct him in your plans, in your strength. when you rest, they die. Eyes are on your beauty until you set. shine, and strengthen (all for) the king. life were the periods which he spent among his Mesopotamian friends and allies. His joy in hunting the lion in the desert south of Sinjar and in the thickets by the river Khabur can be easily imagined, and his love for the chase would gain him many friends among the shekhs of Mesopotamia. His visits to Western Asia stimulated trade, for caravans could travel to and from Egypt without let or hindrance, and in those days merchants and traders from the islands and coasts of the Mediterranean flocked to Egypt, where gold was as dust for abundance. Ti lived in Western Thebes during her husband’s lifetime, and she continued to do so after his death. She visited Tall al-‘Amarnah from time to time, and was present there in the twelfth year of her son’s reign. What appears to be an excellent portrait of her is reproduced on Plate XXXIII of Mr. Davis’s book on her tomb. The monuments prove that, quite early in the Dynastic Period, there was known and worshipped in Lower Egypt another form of the Sun-god who was called RA. Of his origin and early history nothing is known, and the meaning of his name has not yet been satisfactorily explained. It does not seem to be Egyptian, but it may be that of some Asiatic sun-god, whose cult was introduced into Egypt at a very remote period. His character and attributes closely resemble those of the Babylonian god Marduk, and both Ra and Marduk may be only different names of one and the same ancestor. The centre of the cult of Ra in Egypt was Anu, or Heliopolis, and the city must have been inhabited by a cosmopolitan population (who were chiefly worshippers of the sun) from time immemorial. All the caravans from Arabia and Syria halted there, whether outward or homeward bound, and men of many nations and tongues must have exchanged ideas there as well as commodities. The control of the water drawn from the famous Well of the Sun, the ‘Ain ash-Shams’ of Arab writers, was, no doubt, in the hands of the priests of Anu, p. 61 and the payments made by grateful travellers for the watering of their beasts, together with other offerings, made them rich and powerful. The waters of the well were believed to spring from the celestial waters of Nenu, or Nu, and the Nubian King Piankhi tells us that when he went to Anu he bathed his face in the water in which Ra was wont to bathe his face. 1 We may note in passing that the Virgin Mary drew water from this well when the Holy Family halted at Anu. Horus, hawk-headed, and Set, his twin brother; the former was god of the day, and the latter god of the night. about 325 feet long and 245 feet broad. At the west end stood a truncated, or “blunted,” pyramid (A), and on the top of it was an obelisk made of stone (B). In front of the east side of the pyramid stood an alabaster B altar, and on the north side of the altar were channels along which the blood of the victims, both A animal and human, ran into alabaster bowls which were placed to receive it. On the north side of the rectangular walled enclosure was a row of store rooms, and on the east and south sides were passages, the walls of which were decorated with reliefs. Opposite the altar, on the east side, was a gateway; from this ran a path, which led by an inclined causeway to another gate, Which formed the entrance to another large enclosure, about 1,000 feet square. The priests lived in this enclosure, and in special chambers were kept the sacred objects which were carried in procession on days of festival. The principal object of the cult of Ra and his special symbol was the obelisk, but it has been suggested that the earliest worshippers of the sun believed that their god dwelt in a particular stone of pyramidal shape. At stated seasons, or for special purposes, the Spirit of the Sun was induced by the priests to inhabit the stone, and it was believed to be present when gifts were offered up to the god, and when human victims, who were generally prisoners of war, were sacrificed. The exact signification of this sun symbol is not known. Some think that the obelisk represented the axis of earth and heaven, but the Egyptians can hardly have evolved such an idea; others assign to it a phallic signification, and others associate it with an object that produced fire and heat. That it symbolized Ra is certain, and there was in every sanctuary a shrine in which, behind sealed doors, was a model of an obelisk. The cult of the standing stone, or pillar, was probably older than the cult of Ra, and the old name of Heliopolis is Anu, i.e., the city of the pillar. The Spirit of the Sun visited the temple of the sun from time to time in the form of a Bennu bird, and alighted “on the Ben-stone, 1 in the house of the Bennu in Anu in later times the Bennu-bird, which the Egyptians regarded as the “soul of RA,” was known as the Phoinix, or Phœnix. Under the VIth dynasty the priests of Ra succeeded in thrusting their god into the position of over-lord of all the gods, and as we see from the names Ra-Khepera, Ra-Atem, Ra-Heraakhuti and the like, all the old solar gods of the north of Egypt were regarded as forms of Ra. He was king of heaven and judge of gods and men, and the attempt was also made to make the people accept him as the over-lord of Osiris and king of the Tuat, or Underworld. But in this last matter the priests failed, and Osiris maintained his position as the god and judge of the dead. The priests had assigned to Ra in the funerary compositions, which are now known as the “Pyramid Texts,” great powers over the dead, and, in fact, over all the gods and demons and denizens of the underworld, but before a century had passed, Osiris had established absolute sovereignty over his realm of Amentt. From what has been said above it is evident that, before the close of the VIth dynasty, the priests of the various solar gods of Lower Egypt had assigned to each of them all the essential powers and characteristics which Amenhetep claimed for his god Aten. Amongst all the mass of the religious literature of Ancient Egypt, there is no document that may be considered to contain a reasoned and connected account of the ideas and beliefs which the Egyptians associated with the god Aten. The causes of his rise into favour towards the close of the XVIIIth dynasty can be surmised, and the principal dogmas which the founder of his cult and his followers promulgated are discoverable in the Hymns that are found on the walls of the rock-hewn tombs of Tall al-‘Amarnah; but the true history of the rise, development and fall of the cult can never be completely known. The word aten or athen is a very old word for the “disk” or “face of the sun,” and Atenism was beyond doubt an old form of worship of the sun. But there were many forms of sun-worship older than the cult of Aten, and several solar gods were worshipped in Egypt many centuries before Aten was regarded as a special form of the great solar god at all. One of the oldest forms of the Sun-god worshipped in Egypt was HER (Horus), who in the earliest times seems to have represented the “height” or “face” of heaven by day. He was symbolized by the sparrowhawk, the right eye of the bird representing the sun and his left the moon. In later times he was called “Her-ur” or “Her-sems,” the “older Horus,” and it was he who fought daily against Set, the darkness of night and the night Sky, and triumphed over him. The oldest seat of the cult of the Sun-god was the famous city of Anu the On of the Bible, and the Heliopolis of Greek and Latin writers. In the extract from the XVIIth Chapter given above, we must note that 1. Tem originally existed in Nenu, or Nu, the great mass of primeval waters. 2. He was the Only One in existence when he had come into being. 3. He created himself the Great God. 4. He possessed various names, and these he turned into the gods who formed his Pest or Ennead, merely by uttering their names. 5. He was irresistible among the gods, i.e., he was the Over-lord of the gods. 6. He comprehended time past and time to come. 7. He dwelt in the Solar Disk (Aten). 8. He rose in the sky for the first time under the form of Ra, and he was himself the Bennu, i.e., the Soul of Ra. 9. He kept the Registers of things created and uncreated. Though the papyrus from which we get these facts is not older than the XVIIIth dynasty, each of the statements which are here grouped exists in the various religious texts that were written under the Ancient Empire, say, two thousand years earlier. 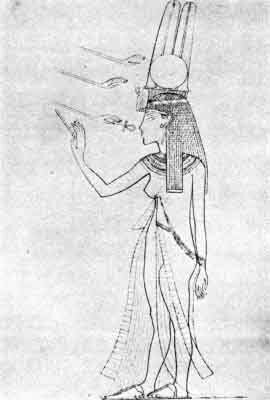 Of the style and nature of the worship of Tem we know nothing, but, from the fact that he was depicted in the form of a man, we appear to be justified in assuming that it was of a character superior to that of the cults of sacred animals, birds and reptiles, which were general in Egypt under the earlier dynasties. Tem, the man-god, absorbed the attributes of Her-ur, the old Sky-god, and of Khepera, the Beetle-god, who represented one or more of the forms of an ancient Sun-god between sunset and sunrise, and of Her-aakhuti (“Horus of the two horizons”). Khepera was p. 60 the sun during the hour that precedes the dawn. Her was the sun by day, and Tem was the setting sun; the names of these gods are of native origin. We may conclude that the priests of Tem incorporated into their forms of worship as many as possible of the rites and ceremonies to which the people had been accustomed in their worship of the older gods. For there was nothing strange in the absorption of one god by another to the Egyptian, the god absorbed being regarded by him merely as a phase or character of the absorbing god. The Egyptians, like many other Orientals, were exceedingly tolerant in such matters. Source via Sacred Texts: THE CULT OF ATEN, THE GOD AND DISK OF THE SUN, ITS ORIGIN, DEVELOPMENT AND DECLINE. The New Kingdom was arguably the height of Egyptian civilisation. Dynasty Eighteen ruled from Thebes and included notable Pharaohs such as Hatshepsut (the most famous female ruler), Tuthmosis III (often called the Napoleon of Egypt) and Akhenaten, the “heretic” Pharaoh who introduced a form of monotheistic religion based on the Aten (the sun disc). Following the disruption caused by the Atenist heresy a new Dynasty was founded by a soldier and vizier Ramesses I. His successors Seti I and Ramesses II (Ramesses the Great) left their mark on the ancient world both in terms of their military campaigns and their building works. The kings of the Twentieth Dynasty took the name Ramesses to connect them with their illustrious predecessors, but they did not live up to the name. This was partly due to a mass displacement of people around the Mediterranean (caused by the Trojan War and the fall of the Mycenaean culture) and a series of poor harvests causing widespread famine. A confederation of races known as the “Sea Peoples” destroyed Egypt’s historical enemy, the Hittites, and threatened Egypt’s borders. By the end of the dynasty, Egypt was torn by civil war and the treasury was empty.